This post discusses plot elements of Homecoming and The Good Place. Homecoming, the new Amazon series based on the Gimlet podcast, revolves the eponymous treatment center, a place where former soldiers receive assistance in transitioning from military to civilian life. The staff of Florida facility is ostensibly invested in creating a safe and comfortable existence for the veterans in their care—though as the series plays out, cracks begin to appear in the façade. It’s not apparent to everyone being housed in this temporary habitat, but Homecoming is as much as trap as it is an idyll. In the third episode of Homecoming, “Optics,” Walter Cruz (Stephan James) and his buddy Joseph Shrier (Jeremy Allen White) commandeer a van in an attempt to confirm where, exactly, in Florida they are. For a while, they’re surrounded by nothingness. But at the end of an extremely long drive, they make a shocking discovery: their surroundings look an awful lot like Hell, and one vision of Hell in particular. Holy motherforking shirtballs: They’re in The Bad Place. Well, they are and they aren’t. This is no act of fan-theorizing; Homecoming and The Good Place share a number of thematic and storytelling elements—that slow-burn reveal, the simulated realities, the seemingly benevolent overseers who turn out to be anything—but not a fictional universe. What they do share are studios organized under the same parent company, NBCUniversal, one that also owns a storied Hollywood backlot whose Little Europe section can play both a charming little eternal torture chamber and a cozy retirement community that causes two veterans to briefly question the nature of their realities. As confirmed by representatives of Amazon Studios and Universal Cable Productions, that Homecoming vignette was shot on one of the Little Europe sets also used in The Good Place. 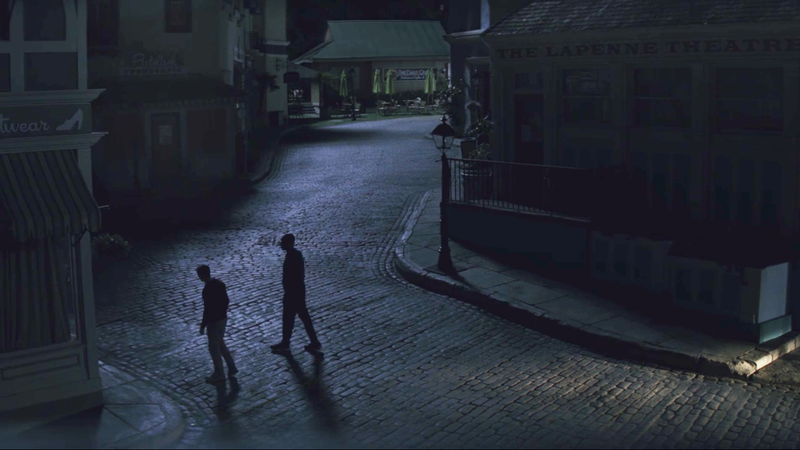 The former’s Lapenne Theatre is the latter’s Your Anticipated Needs; in more recognizable Good Place landmarks, that café deep in the background of the Homecoming screenshot is the railroad station that brings Trevor and his goons to Neighborhood 12358W and facilitates Eleanor and Chidi’s many, many Cruz-and-Shrier-like flights to The Medium Place. Little Europe is a long-standing fixture of the Universal backlot, featured in many of the studio’s classic monster movies and appearing in television productions as varied as Buck Rogers In The 25th Century, Murder She Wrote, and Angel. And now you can add to that list two superlative mindfucks mindforks.